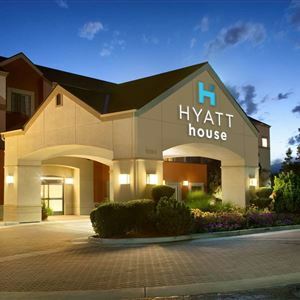 Property Location When you stay at HYATT house Denver Tech Center in Englewood, you'll be in the business district and convenient to Fiddler's Green Amphitheatre and Lollipop Park. This hotel is within close proximity of Park Meadows Mall and Westlands Park. Rooms Make yourself at home in one of the 136 air-conditioned rooms featuring kitchens with full-sized refrigerators/freezers and stovetops. Your room comes with a pillowtop bed, and all rooms are furnished with sofa beds. Wired and wireless Internet access is complimentary, while 32-inch flat-screen televisions with cable programming provide entertainment. Conveniences include desks and separate sitting areas, as well as phones with free local calls. Amenities Don't miss out on the many recreational opportunities, including an outdoor pool, a spa tub, and a 24-hour fitness center. This hotel also features complimentary wireless Internet access, concierge services, and gift shops/newsstands. Guests can get around on the complimentary shuttle, which operates within 5 mi. Dining Grab a bite from a snack bar/deli serving guests of HYATT house Denver Tech Center. Meet other guests and eat at a complimentary reception. Quench your thirst with your favorite drink at a bar/lounge. Business, Other Amenities Featured amenities include complimentary wired Internet access, a 24-hour business center, and express check-in. Planning an event in Englewood? This hotel has 1,100 square feet (0 square meters) of space consisting of conference space and meeting rooms. A train station pick-up service is provided at no charge, and free self parking is available onsite. When you stay at HYATT house Denver Tech Center in Englewood, you'll be in the business district and convenient to Fiddler's Green Amphitheatre and Lollipop Park. This hotel is within close proximity of Park Meadows Mall and Westlands Park. Make yourself at home in one of the 136 air-conditioned rooms featuring kitchens with full-sized refrigerators/freezers and stovetops. Your room comes with a pillowtop bed, and all rooms are furnished with sofa beds. Wired and wireless Internet access is complimentary, while 32-inch flat-screen televisions with cable programming provide entertainment. Conveniences include desks and separate sitting areas, as well as phones with free local calls. Don't miss out on the many recreational opportunities, including an outdoor pool, a spa tub, and a 24-hour fitness center. This hotel also features complimentary wireless Internet access, concierge services, and gift shops/newsstands. Guests can get around on the complimentary shuttle, which operates within 5 mi. 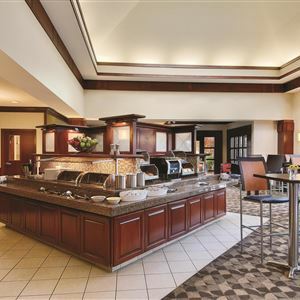 Grab a bite from a snack bar/deli serving guests of HYATT house Denver Tech Center. Meet other guests and eat at a complimentary reception. Quench your thirst with your favorite drink at a bar/lounge. Featured amenities include complimentary wired Internet access, a 24-hour business center, and express check-in. Planning an event in Englewood? This hotel has 1,100 square feet (0 square meters) of space consisting of conference space and meeting rooms. A train station pick-up service is provided at no charge, and free self parking is available onsite.